headphone amplifier, all with a separate power supply. Featuring a hand-built 72 (0.85dB) step volume control, the Enigma is a definitive electro-mechanical device of unparalleled performance, incorporating a unique auto-transformer design, fully utilizing Townshend’s proprietary F1 Fractal™ wire technology. It Is absolutely transparent, with vanishingly low distortion and zero noise. 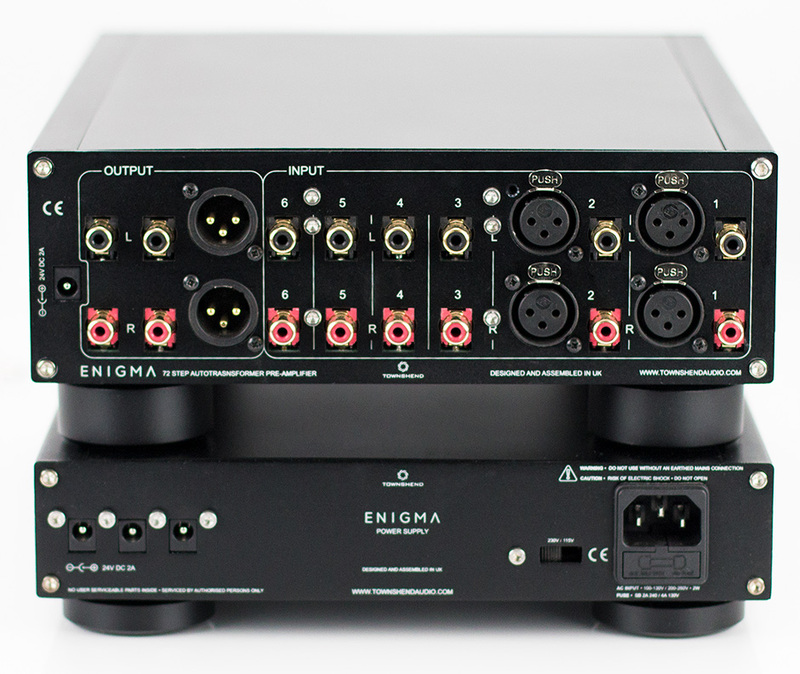 The Enigma has six stereo phono inputs at the rear and a 3.5mm jack on the front panel (in parallel with input 6). Additionally, two pairs of balanced XLRs are paralleled to inputs 1 and 2. It has two stereo phono outputs, one pair of balanced XLR outputs and 6.35mm headphone socket. For optimum component performance, the casework is soundproofed with double-layer constrained layer damping, with feet incorporating soft vibration absorbers modules. Available in natural or black anodized aluminium. The remote control is a standard Apple remote. All push-buttons are illuminated and a light above the volume control flashes to indicate a remote-control operation. Townshend Autotransformer preamps have received many positive comments from many satisfied users and have received stunning reviews in the world’s most prestigious magazines. They are used by two of the world's most eminent speaker manufacturers as the master controller when voicing and setting the tonal balance of their new speaker range(s) – chosen because they are the lowest distortion, lowest noise, most natural and uncoloured sounding preamps they can find. 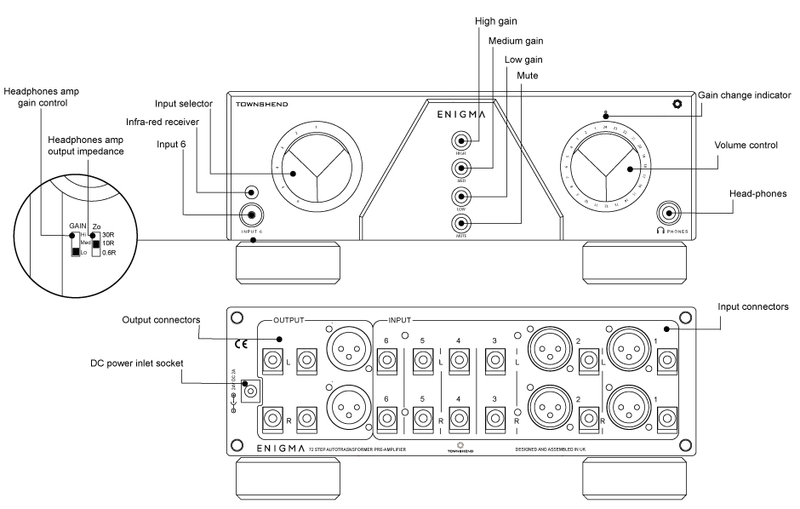 The class A headphone amplifier has a three-stage gain switch to accommodate high, medium and low gain headphones. The gain is adjusted by a slide-switch mounted on the left underside. Next to this is a second switch to select the output impedance. This is to accommodate the wide range of headphone requirements. In situations where higher preamp gain is required, the output of the headphone amplifier is ideally suitable. This converts the Enigma to an active preamplifier, with up to 14dB of gain. The Enigma Linear DC Power Supply is designed to be the optimum power source for the Enigma Preamplifier, especially the headphone amplifier. The supply delivers 24V DC at 2A peak. The mains input is filtered by a triple-choke low-pass filter to remove as much mains noise as possible before the power is fed to the large toroidal mains transformer. The transformer is considerably underrated, as this delivers by far the best sound. There is 30,000µF of filter capacitance and three stages of voltage regulation. This ensures the purest DC possible. To maintain the integrity of the Fractal™ wired transformers, it is strongly advised to use Fractal™ Interconnects for both the input and output cabling and to use Townshend Audio’s F1 Fractal™ speaker cable. This has been shown to give the best possible sound. Frequency response: 8Hz-80kHz +/- 0.1dB. Maximum signal level: 4V RMS 8Hz; 10V RMS 20Hz and up. Maximum DC offset : 5mV (For undistorted 8Hz). Distortion: Less than 0.01% at 400Hz, 10V (2nd and 3rd harmonic only). Impedance: At 0dB, input impedance is 20kohm. At -10dB (normal listening) input impedance is 200kohm. Inputs: Six pairs of RCA phono sockets (gold plated) Two pairs of XLR One 3.5mm stereo jack on front panel, in parallel with input 6. Outputs: Two pairs of RCA phono sockets (gold plated) One pair of XLR One 6.35mm stereo headphone socket. 850mW. Output impedance 0.1, 10 or 30ohm Gain 2.5dB, 8dB and 14dB. Power: External DC supply 24V 2A. Dimensions: Width 234mm (5.3in), Height 100mm (4in), Depth 334mm (13.2in).